Replacement bolt kit to attach stabilizer bars. 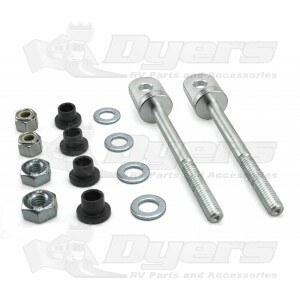 This replacement bolt kit for your JT's Strong Arm Jack Stabilizers comes with 4" swing bolts that are used on front and read jacks to attach each JT's Strong Arm stabilizer bar. Ordered as a replacement when I swapped from one trailer to a new trailer. Just as described and was the best price around.